-Preheat oven to 350 degrees F and then toast the walnuts and pistachios for 8 minutes till lightly toasted.Also line a 13*9*2 " pan with butter or parchment paper. -Peel and wash the carrots.Then grate them in the small grater holes and keep aside. -In a large bowl,whisk the flours,baking powder,cinnamon,baking soda, & salt . -In another bowl beat the eggs one by one till frothy and add sugar into it little by little till it turns pale.Add in the oil and vanilla extract. -Add the flour mix and combine well till incorporated. -Then finally fold in the grated carrots and nuts. -Pour the batter evenly into the prepared cake tin & Bake for 30-40 minutes or until tooth pick inserted in the centre comes out clean. -Remove from oven & cool on wire rack.Cut into pieces and serve. * You can also bake 2 loaf of 9*2 inches and prepare a cream cheese frosting too for a party cake.bake for 25-30 minutes. * You can use pecans too instead of walnuts or pistachios. Carrot cake looks delicious. I like you used pistachio and walnut. Very nice tea time cake. Have a look at my Sweet Dosa. This is our family cake.. love it... yours have come out so well.. nice colour and texture..
Looks moist and yummy; love good carrot cake! Healthy cake indeed!! Looks yummy too..
Julie thanks for linking it to my event. As regards the cake... its delicious not only have you used whole wheat flour, nuts and carrots its truly amazing and it needs no frosting at all. Belated wishes to your friend. Has come out so well, love those pistachios in between.. Wish to have a slice rite now,wonderful looking carrot cake. Loved this soft,moist and delicious cake! The cake looks absolutely soft and yummylicious. cake looks so soft and delicious.Perfect birthday surprise for your friend. 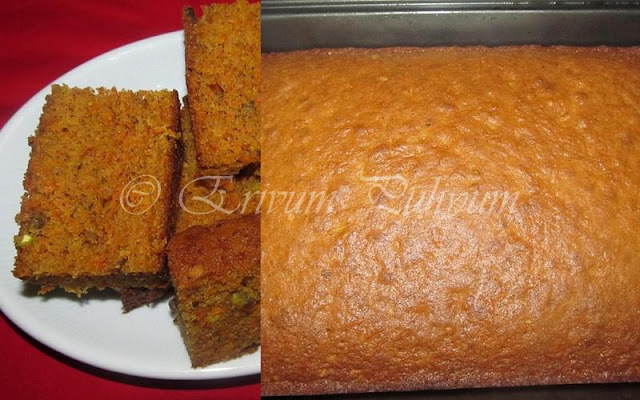 seeing the pic i rushed into your space but knowing taht egg is one of the ingredient,left it..plz post eggless cakes too..
Greattt carrot cake, looks super..
Super delicious and yummy looking cake. 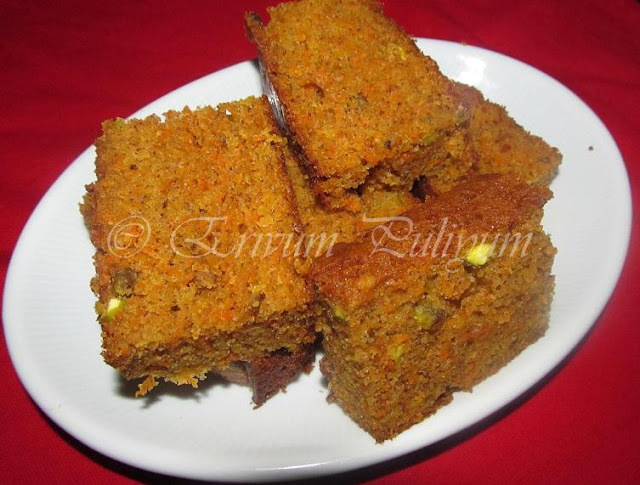 truly, the best carrot cake ever...so soft and spongy.. So moist and soft. Perfect cake!